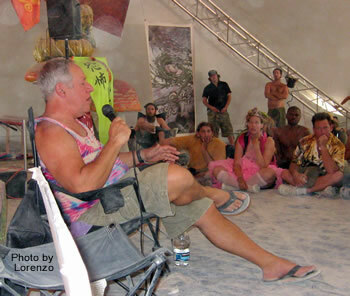 In his 2006 Palenque Norte lecture at Burning Man, Nick Sand explains how best to use some of the more interesting combinations of sacred medicines. Additionally he answered a wide range of questions that included such diverse topics as the relationship of the atomic bomb to LSD and the reasons he left the quiet life of academia to create Orange Sunshine, which was considered to be some of the best acid available in the 1960s. Posted in Burning Man, LSD, Nick Sand, Palenque Norte, Psychedelics and tagged Burning Man, LSD, Nick Sand, Palenque Norte, Psychedelics. Good to read about getting back in touch Lorenzo! Please let us know of the outcome and plans (the biography ?). Can we expect any new interviews with Nick Sand, Lorenzo? I’d also be interested to hear more from this individual. I’ve heard he and the brotherhood of eternal love had ridiculously elaborate ceremonies involving psychedelics, which I think the public would be very interested in learning about. That’s the thing at this point; there is a huge culture of psychedelia which the internet has helped link together and educate, but there is not a lot of systematic education about the actual use of psychedelics. I read in one of Sand’s articles on DMT that he had an ambition to start the “University for Psychedelic Studies”. I personally think it will be quite a while before society is open enough for that to happen. But, wisdom may now be shared like never before with the internet. I’d say that it would be quite fitting for such an academic institution to begin in cyber space. I hope “Psychedelic Secrets” is published soon. Any chance we will hear more from you and Nick this year? Yes I am also curious what Mr. Sand is up to. Always interesting to hear his input. I look forward to the upcoming biography and interviews. Is the book coming in 2013 ? A biography ? Sweet ! Another N. Sand fan here. Lorenzo thank you very much for the fast reply. p.s. Just listened to the Fadiman podcast. Book has been bought ! Any chance for a new Nick Sand podcast ? I am always left in awe when hearing one of his talks.